Daily Glass: California Gamay? How about it! The process of selecting of the bottle to open sometimes can be very daunting – may be this? But I just had it few days ago. Than that? Well, today is not special enough day? Then what about that one? Nope, doesn’t feel right. In the end of the day (not literally), you just bite the bullet and say “this is it”. So the end result of my nerve wrecking selection process today was a bottle of … California Gamay from Field Recordings. Now, class, who had the opportunity to taste California Gamay – raise your hands. Yep, I thought so. It is not that often that you hear about California Gamay. It is not even too often that you hear about Gamay been grown anywhere in US. Beaujolais? Of course, Gamay is one and only. Loire? Sure, also quite popular. Switzerland? Lesser known outside of Switzerland, but still – yes, it does quite well there. But California? Well, so as they say, there is a first time for everything. Today was my first time to taste the California Gamay. 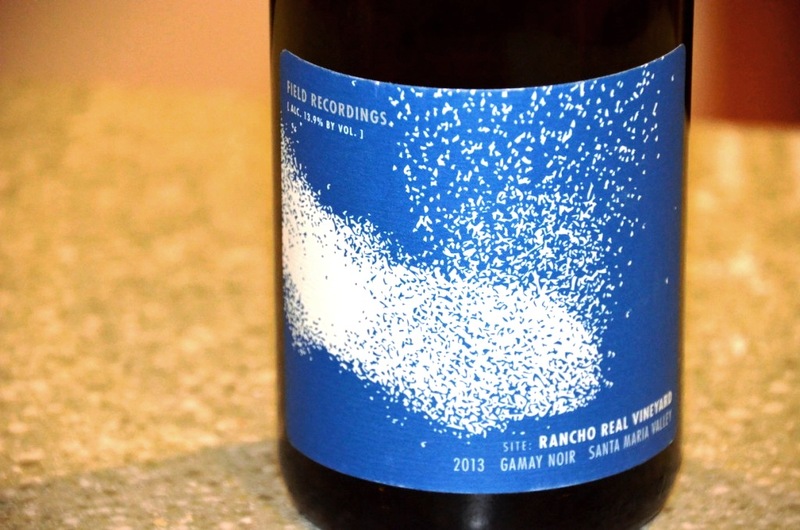 2013 Field Recordings Gamay Noir Rancho Real Vineyard Santa Maria Valley, California (13.9% ABV, 100% Gamay Noir, 6 month in Neutral Puncheons, 50% carbonic, 50% destemmed, 140 cases, Bottled: 04.19.2014) – very interesting. 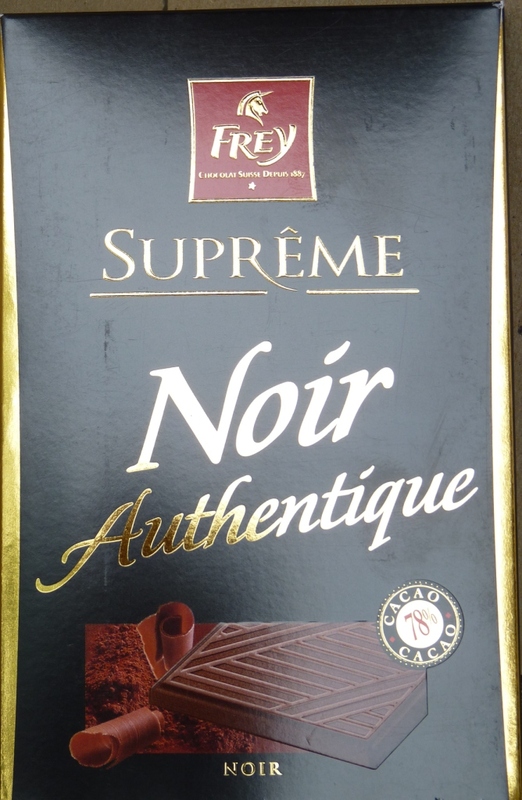 The nose was reminiscent of the Beaujolais Nouveau, but with the fruit being more mature and restrained, not as grapey. 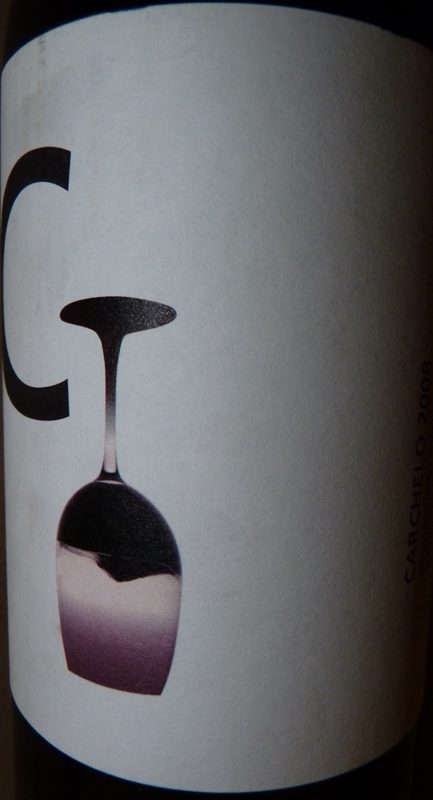 Very delicious and pronounced, similar to all other Field Recordings wines I had so far. And the palate… The palate was puzzling. It had a lot of fresh, ripe raspberries, good acidity and good balance, but there was something else which took me a while to figure out. And then it came down to me – the wine was still coming together. It was very similar to the Chenin Blanc which I had directly from the tank at the winery. Fermentation or not (I’m not a winemaker, so I can’t tell you exactly what it is, I can only describe to the best of my abilities), but this wine still needed time. This is why I highlighted above the date when the wine was bottled – so I was having the wine which was bottled only a bit more than a month ago – and it was noticeable. The wine was not bad by all means – but it would be very interesting to know, how would it taste when it would finally come together as a whole. Note to self – for the young wines, try to read the labels before, not after. Anyway, it was an interesting experience, and I will have to go with Drinkability of 7+, as the wine was still pleasant. Oh yes, of course it was my one and only bottle. Have you had California Gamay before, or any US Gamay for that matter? What do you think? Also, have you had the wine which wwas not done yet? Comment away and cheers! Disclaimer: this blog post is not an attempt to create the new rating system. It is rather an account into the emotional escapades of the oenophile tasting wine. 1. 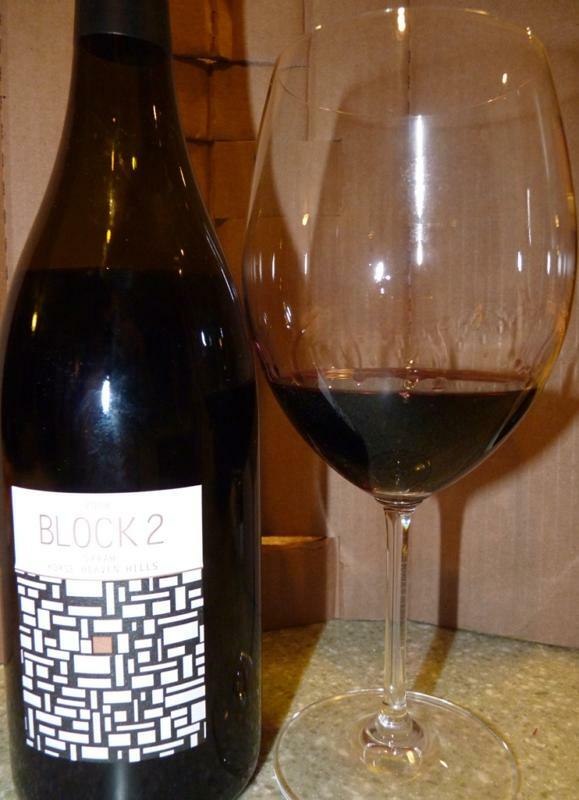 The wine is perfectly balanced – fruit, acidity, tannins, texture, structure – all together. 4. “Beautiful wine” designation is totally spontaneous and emotional. It usually happens after the first sip and the subsequent uncontrollable “wow”. When it comes to the term of “interesting wine”, that happens when I’m puzzled, like “hmmm, interesting, I’m not sure what to think of it”. Please understand that it is very different from “ouch, it needs time”, “what is it?? ?”, “crap” and “this is disgusting”. “This is interesting” simply means that I can’t put a handle on what I’m tasting, where, for instance, the initial sensation of round and silky is followed by something harsh and unbalanced. “This is interesting” usually ends up being extended into “hmmm, this is interesting, let’s give it some time”. From this point on, the wine can be put aside to be drunk at another day, or it might go into the decanter if I feel that it would be sufficient to change it. 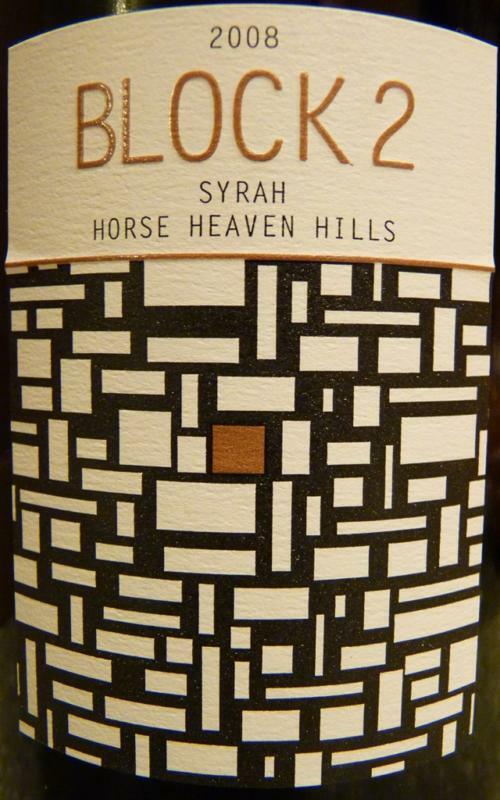 Here are the few wines we had last week, some beautiful and some are … interesting. And that concludes my post. Any beautiful or interesting discoveries you care to share? Comment away! Cheers! Today was my wife’s 19th anniversary of coming to US, so I was looking for the appropriate wine to celebrate. I didn’t have anything from 1993. There were ’86, ’88 and ’90, but somehow opening those wines didn’t make too much sense. And then I saw a bottle of Norton. No, it was much younger than 19, but Norton is often called a True American Grape, so it should be perfect for the occasion. 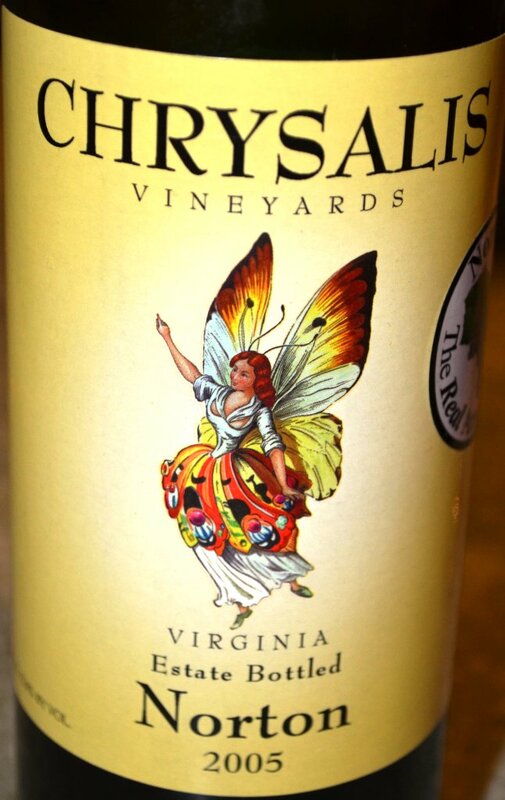 So I pulled this bottle of 2005 Chrysalis Vineyards Norton Estate Bottled from Virginia (12.8% ABV), which I got during our visit to Chrysalis Vineyards about two years ago (here is the post about it). Somehow, from the moment the cork was pulled, the wine worked perfectly. It had that hint of barnyard aroma, just a hint, as much as you get from the well made Loire Cabernet Franc – a bit of explicit earthiness on the nose. On the palate, it was very restrained and balanced, quite dry – somewhat similar to Barolo, only without a bear claw grip of tannins, with some leather and again earthy notes. As the wine warmed up, it showed more fruit, some raspberries and plums, with good acidity, and it stayed very balanced until, well, the bottle was empty. In terms of rating, I will put Drinkability at 8. I’m sure this wine will continue evolving – but this was my only bottle, so it is what it is. Oh well, at least it was a good bottle of wine, so no regrets here. Cheers! It’s been awhile since I posted in the Daily Glass category, and by design of this blog the plan was actually to have the posts exactly as it said – daily. Well, we all have plans, and then we have the reality – whether we like it or not. A couple of months back, I got an email from Benchmark Wine Company with an offer to buy the wine. 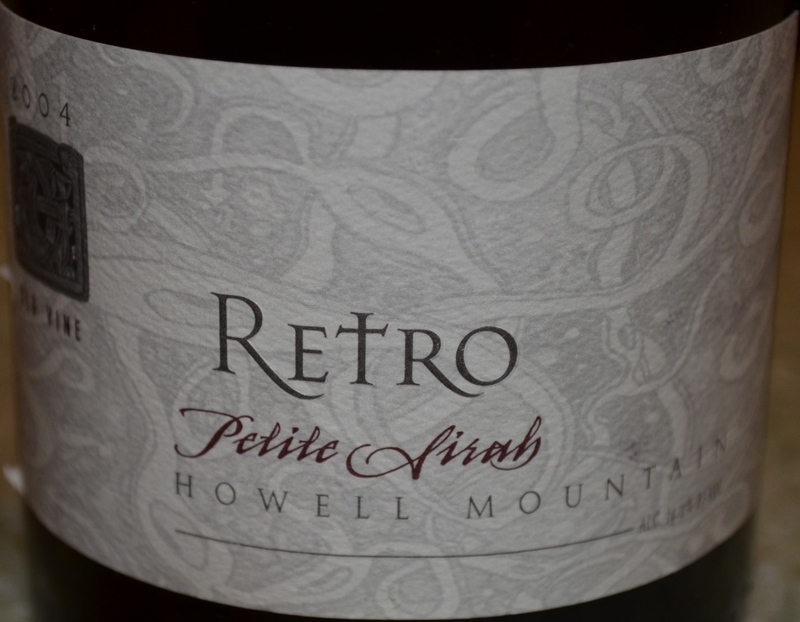 It was about Petite Sirah, and the way it was written, it was hard to resist (besides, Petite Sirah is one of my favorite wines in general) – so I got a few bottles of Retro Cellars Howell Mountain Petite Sirah. To be more precise, I got one bottle of 2004 and 2 bottles of 2007. That sentiment (needs time!) was also confirmed when I turned the bottle over – it was made by Mike Dunn, the son of Randy Dunn, one of the best winemakers in the Napa Valley. known for making Cabernet Sauvignon wines which require a very long aging period (some stories about Randy Dunn were mentioned in the last issue of Wednesday’s Meritage). I definitely enjoyed the wine – but when it comes to the 2007 which I still have, patience ( and a lot of it) will be my best friend. Cheers! Now, let’s talk about different experience. Burgess Cellars had being making wines in California since 1972. One thing which I find very interesting (ok, just to be very careful – here “interesting” is a good thing ), is a Library program, started ion 1980, where the wines would age at the winery before being released to the market. 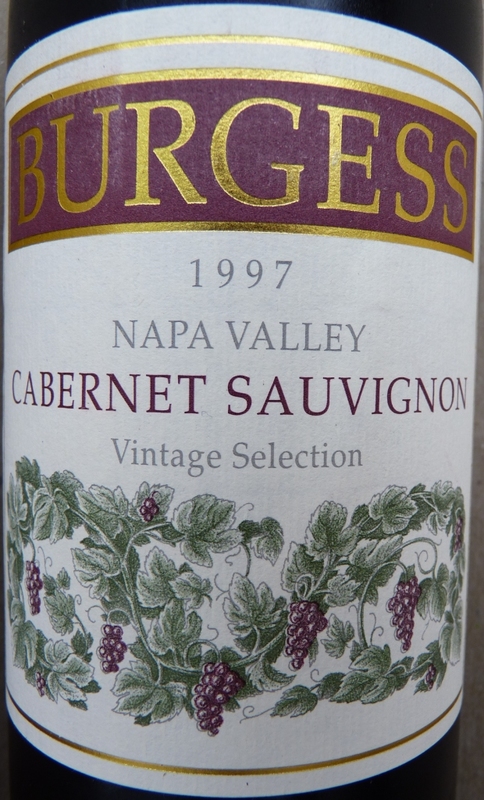 So this weekend we had a chance to try Burgess Cellars Cabernet Sauvignon Vintage Selection 1997, which was recently released (and I have to thank Wine Till Sold Out for an opportunity to get it at a great price, $24.99). 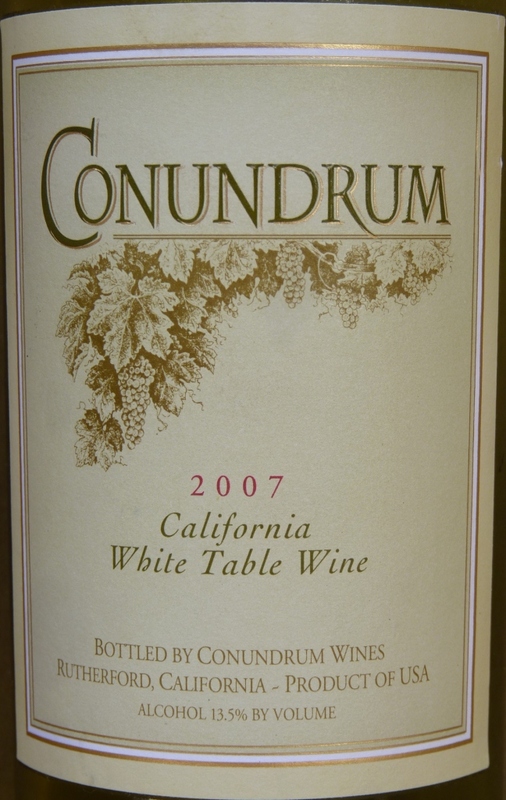 As I’m referring to Wine Spectator ratings in this post, this wine had a rating of 90. Also, if anyone is curious, this wine consists of 80% Cabernet Sauvignon, 11% Cab Franc and 9%Merlot. Now, in the terms of my “pleasure”-centered ratings, this was a great wine – it had a layered complexity with dark fruit, such as black currant and blackberries, hint of earthiness, eucalyptus and cedar, all supplemented by fresh acidity and round tannins. The wine is ready to drink now, but will continue to evolve for another 5-7 years, and I’m looking forward to that experience. So here is your call for action for today: be amused, try something new – and make sure to share your experience! So, what do you think – is there a such thing as dangerous wines? Let’s leave all the issues of addiction outside of this conversation, as this is not worth debating – addictions are bad, no matter what the subject is, so let’s leave it at that. So let’s start again – when would you call the wine “dangerous”? First, of course, there are all the forms of the wine faults – wine can be corked ( smells like musty basement, not pleasant to drink at all, because no flavor left), wine can be oxidized (again, no flavor left), wine can be “cooked” ( this is usually the result of of prolonged exposure to the heat, like transporting the wine for a day or two in the trunk of a car during hot summer), and so on. If you actually interested in learning more about wine faults, here is very good Wiki article. Then the wine can be simply not made well. This is the case when you try the wine and you just want to spit, and then you declare a bottle “not good even for cooking”. Not sure if this is the case of “dangerous” we are looking for, but this is definitely the case of wine we don’t want to drink. And now, let me explain what I call a “dangerous” wine. To me, dangerous wine is the one you can not put down. You take a sip, you say “wow”, you take another sip, your glass is empty, and then in a while you don’t understand what happened with the bottle? Where this all go? Did I spill half a bottle? Is my dog walks suspiciously – but, hey, she couldn’t reach that bottle, right? So what just happened here??? Yep, the wine was so smooth, so round, so it went down so easily that now you completely astonished – but it’s all gone… This is what I call dangerous :). Try is today, and tell me if how dangerous it was for you! Just to finish the story on 2007 Cameron Hughes Cabernet Sauvignon Lot 140 – I did try that wine over the next two days, with expectation that as the wine will age in the open bottle (of course the bottle was not standing open, the air was removed using one of my favorite accessories, Vacu Vin Pump. Unfortunately, aging process didn’t help the wine to become balanced – alcohol, tannins and fruits all were standing on their own, refusing to meld. Therefore, the 7- is the final word on that wine. And now, let’s talk about totally different wine experience. Get a case for yourself and enjoy!